Monogatari Series: Off Season consists of additional stories that occur throughout the main series timeline. Yotsugi Ononoki, the shinigami girl assigned to watch over Koyomi Araragi. This dead tsukumogami girl faces a challenge, but what exactly is that do-or-die struggle with her life on the line? As the "story" grows, it keeps on running, ever burning bright! These are the modern-day oddities! Oddities! Oddities! Youth is going back and forth between pain and peace. Volume 2. Wazamonogatari (業物語) "The name Kiss-Shot Acerola-Orion Heart-Under-Blade has always been attached to me..."
About 600 years from the present, this now-destroyed country was where the girl called the "Fair Princess" had lived. With such beauty that anyone would offer one's life for, the road the girl trod on became a mountain of corpses. These are the legendary oddities! Oddities! Oddities! Youth is cruel like a fairy tale. The girl who was once a god, Nadeko Sengoku. 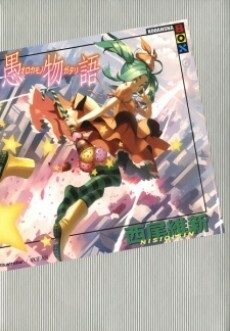 She, who followed her dreams and was forced into reality, is successful in creating an alter ego by borrowing the power of the little girl shikigami, Yotsugi Ononoki. However, the four "Nadekos" run away, scattered……? The Oddities! Oddities! Oddities! of these modern days. Youth is being unable to control even oneself. "I don't know anything. You're the one who knows... Officer Araragi." Cracking down on a "rumor" before it can turn into a ghost story. Police officer Koyomi Araragi who has begun working at the Hearsay Department of Naoetsu Station. Hitagi and Tsubasa, who have left town. What paths have the three have chosen after turning 23 years old... and what are the feelings Koyomi will convey in the end...? As one knows more, the more you find things you don't know. For all time, these hearts in love cannot be unbound.